LIFE recently talked with twenty-eight-year-old Kyle Reschke—who joined WBC’s Global Outreach team this past May—about his roots, his passions, and the experiences God has used to prepare him for this new season of ministry and service at Wheaton Bible Church. Kyle, tell us about your growing up years. I was born in Naperville, and I’ve spent most of my life growing up in the Chicago suburbs and in this area. My parents—both teachers in the Naperville public schools—have been very happily married for thirty-one years. For the last several years, my mom has worked with the early-childhood at-risk program at the Early Childhood Center. My father has been in the district for thirty-three years and has been teaching at Kennedy Junior High School for nineteen years. Both of my parents are very athletic, very active. My dad coached at Naperville Central High School, mainly in cross-country. 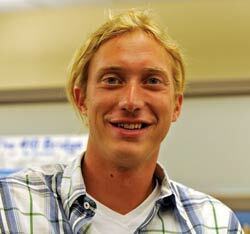 He was the head coach for women’s cross-country there. So I remember a lot of family bike rides and runs. I’m the oldest of three kids. My brother, Kent, is twenty-six. And my sister, Kristen, is twenty-three. Help us get to know you by talking about some of your hobbies and interests. I’m an avid runner and cyclist. I also enjoy adventure races, including kayaking, rock climbing, rappelling, and some more-survival-type stuff. I’ve always had a love of books and usually get through a couple of volumes a week. I particularly enjoy reading the great books of the Western tradition, including the works of ancient writers —like Aristotle, Plato, and up to Cicero—and the early church fathers, through the major intellectual movements in history. One of my other hobbies is music. I’m a classically trained French horn player and minored in music performance in college. 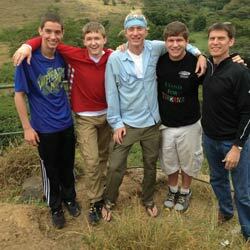 Kyle (center) with students Shelton Thompson, Micah Volle and Ben Cataldo, and Global Outreach Pastor Bill Oberlin. I recently finished my second master’s degree, a Great Books course at Faulkner University in Montgomery, Alabama. My emphasis was a study of the philosophy of science and bioethics. That’s been a big interest of mine because my undergrad degrees were in cellular and molecular biology at Winona State University. Education for me has been “all over the place,” because I was originally finishing my undergrad degree and heading to medical and dental school at University of Illinois Chicago to become an oral and maxillofacial surgeon. Instead, I deferred my acceptance for a year to explore teaching—something I’ve always enjoyed, including summer jobs in this area with WSDRA (Western DuPage Special Recreation Association). I’ve also been a coach for the Special Olympics and ran a lot of after-school and social and academic and music programs for children with special needs in this area. I always loved my involvement in those programs. So, my education plans changed, and instead of medical school, I attended National Louis University to get a master’s in education, and I fell in love with teaching. I realized there are so many places around the world where people are crying out for this tremendous blessing of education but they don’t have the opportunity to pursue it. After finishing that graduate program, I was accepted by WorldTeach (an agency that partners with governments and other organizations in developing countries to provide volunteer teachers), for a program of the Center for International Development at Harvard University. I signed on as an educational developer with a pioneer team on a remote group of islands in the South Pacific in American Samoa and Samoa. You’ve picked up some language skills along the way. Yes, in addition to English I am proficient in Haitian Creole, Haitian Sign Language, and American Sign Language. I used to be pretty proficient in Samoan, although I haven’t used it in about six years. Teenage Kyle with brother, Kent; Dad, Keith; sister, Kristen; and Mom, Sally. I did not come to what I call real faith until college. I grew up in a believing family. We attended Grace United Methodist Church in Naperville, and my parents always encouraged us to be active at church, in youth group, and things like mission trips. In college I was active in InterVarsity and at an Evangelical Free Church near the campus of Winona State University. I got plugged in there and helped lead a Friday worship night for college students. It was there, in the fall of my sophomore year, that I was truly brought to my knees by the realization of what a true follower of Christ looks like. There were pieces of the puzzle that I’d been missing in the pursuit of Him and in following Him. So that’s when I really came to faith, accepting Christ as Lord of my life. I had a teacher my freshman year of college who was taking some seniors and graduate students to the Himalayas in India and Nepal on a research expedition to study how the human body adapts to extreme environments. Because I was thriving in his physiology class, he invited me to participate. So at nineteen I had this grand adventure into the Himalayas, when I explored how the human body works physiologically. Our base camp, where we were camping out to take on our bigger peaks, was at an elevation of around 16,000 feet—well over a thousand feet higher than the tallest mountains in the continental US! That left me in awe of who we are as created people and led me to decide that I wanted to get into the real minutiae of human physiology. So I switched my major to cell and molecular biology. This was the time God inscribed Himself on my heart. 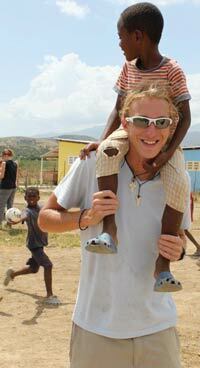 Talk about your ministry in Haiti. How did that come about, and what did you do there? The Lord used a whole series of events to lead me to a seriously impoverished area—the slums of Port au Prince—as a kind of development consultant, especially educational development. At that time I was worshipping at Frazer United Methodist Church in Montgomery, Alabama, where I was in a master’s-degree program. The church had decided to be a major funder and partner for development in the Haitian deaf community. After the earthquake in 2010, deaf, blind, or otherwise physically disabled people had gathered together, just to survive, in Cité Soleil—the worst slum of the Western Hemisphere. The church wanted to be involved there but knew this would be a huge project and that they needed the help of experts. That expertise came through an organization called the 410 Bridge. The 410 Bridge pursues community change from a foundation of life transformation in Jesus Christ. Faith in Jesus flows into development and education, health care, and all the rest of what they do. Like World Relief, 410 Bridge partners with churches that really want to be engaged in the work it’s doing. One day while I was writing my thesis in bioethics, I ran into the teaching pastor at a coffee shop. Our conversation led to a meeting with him and the missions director, who asked if I would be willing to go on a one-week vision trip to Haiti in an advisory role. Then I would give them my ideas for the best ways they could support the program there. I went to Haiti, and one day I was standing in the slum—the biggest tent city in Port au Prince—with a group of deaf people. (I had started acquiring sign language by that time.) I turned to the 410 Bridge personnel and to the pastors from Frazer and said, “You said there’s a possibility you may be looking for somebody to come down here and run things for a while, especially to help build leadership capacity. Well, I’m coming. I would love to speak with you all about being your guy on the ground. If that doesn’t happen, I’ll seek funding elsewhere, and I’ll be down here anyway.” God just made it that clear. We returned home, and 410 Bridge decided it was the right time to have an American “on the ground” just for a couple years. They made it very clear that my mind-set was to be to work myself out of a job. I went to Haiti as a fully supported missionary of Frazer United Methodist Church and project manager for the 410 Bridge. I moved into the slum with the deaf community—one of the largest groups of deaf persons in the world outside of the universities for the deaf. As project manager for the Haiti deaf community, my role was overseeing all aspects of the development of spiritual foundations, as well as health care, education, clean water, micro-enterprise, and sustainable agriculture. When I returned home, I was a very worn-out individual. The greatest need in the Haitian deaf community was peace—peaceful interactions between various people groups and peace among individuals. But things were on such a survival level that the people really didn’t have any other choice but to fight over what little was available. It was a pretty constant battle, being an advocate for a group of people who had been stepped on and marginalized for their entire existence. The Haitian culture had essentially told them, “You’re worth less than us.” In fact, tens of thousands of people in that area were quite upset that this highly marginalized population would get opportunities before they did and even have an American advocate. How did this marginalized population get the confidence to come together? The deaf families and individuals tell stories of waiting in lines for food, water, and medical attention after the earthquake. When they communicated by signing, they would be beaten up and kicked out of line. They would go home and tell their families they couldn’t get food that day—all because they were deaf. Unfortunately, they ended up having to settle in this slum, Cité Soleil. But they settled together, 168 families altogether. When you say “slum,” what does that mean in terms of housing? It would be like a tent the size that maybe three people would camp in here in the United States. Only there, eight to ten people are living in it, piled on top of one another. And no more than six inches between one tent and the next. But they chose that in order to be together? Yes. It was a matter of survival. Alone they wouldn’t survive. That’s what they voted for, so that’s what we started to pursue. And that all worked out well because of some key partnerships: a land donation from the Haitian government to 410 Bridge and Mission of Hope, our other big partner, would build at least five hundred homes for people displaced by the earthquake and would engage in real holistic development. They agreed to do that and have since met that goal in less than two years. They’re still building almost twenty-five homes a month—cement-block houses, fourteen by twenty feet, with three rooms, plus family gardens! What about building faith and sharing the Gospel? The Gospel was a part of everything we did, but these people are hard to reach. The people of Haiti in general—and especially the deaf—are one of the largest unreached people groups in the world. Some 90 percent of the Haitian people claim to be Christians. The statistic I share describes the spiritual climate in Haiti as, “95 percent Christian, 100 percent voodoo.” It’s not that Haiti is an unchurched country. The culture is highly churched, with deep roots in Catholicism. But voodoo has also been a part of their cultural identity for centuries. So when you talk about the Trinity, the community of the saints, and other doctrines, to the people there, it can look nearly identical to their pantheon of gods, their upper gods, and their lesser voodoo gods. On top of that, things are so much on a survival level that people don’t have the leisure to sit and talk, to share and be a real community. I saw that what was needed for the foundation of spiritual growth and for the rise of the Gospel in this community is a day when people are able to sit on their front porches with a cup of Haitian coffee, cooking some beans and rice over charcoal, and just kind of taking in a cool night and talking. It’s when you can get past the survival mind-set that the big questions of life come out. Do you see a time when the influence of corrupt politicians and other evil will decline? There came a day when some of the political leaders as well as some of the other religious leaders saw power fading, because people knew who was really helping them and who really believed in what they could do. At that point we all—the leaders of the community, myself included, the director of Mission of Hope, and other organizations—stood before the community and said, “Here’s what we feel your options are. The only way we can have continued development is if there’s peace in the community. Decide what kind of story you want to be telling as a community. That was really the day the political leaders, who were not in it for the best of the community, were run out of town. We didn’t hear another word from them. It had been a battle of worldviews, of good and evil that declared “me first” or “us first,” which is a pretty major battle everywhere in our world. By God’s grace and mercy I came home from Haiti knowing that we had been a part of creating new life. People were relocated out of the slum into a permanent housing situation that also provided education, health care, clean water, microenterprise, sustainable agriculture, pastoral training, and leadership training. The deaf-community project has now been widely recognized as one of the best development projects in Haiti to date. The New York Times wrote about it, as did the audit firm Price Waterhouse Coopers. There was even a documentary shown throughout Europe that described how this community that had been stepped on and didn’t have any opportunities before, all of a sudden became a kind of core group of people who are learning how to believe in themselves and their capacities and their assets. Those who had never had a voice before are making it into world media. They are proving the rest of their country wrong by showing themselves to be harder workers, and in some cases more capable, because they’re working together peacefully toward something better for the whole community. What did this experience do for you? It taught me a lot about development work. I obviously can look back and see a lot of mistakes I made, but I also learned how we really empower and develop people, by getting ourselves—whatever roles we’re in—out of the way to really support those who are pursuing a better life for themselves. The greatest learning was about the amount of patience, the amount of time, and the level of investment that takes. Investing in people is so much more difficult than investing money. Sometimes the American church has had little effect overseas because it has invested money and called that investing in people. We’ve paid people to do what they should be doing for themselves. Personally, I learned a lot about life balance. I worked myself nearly to death, truly, in that environment. When I returned home, I was as skinny as I’ve been since I was around twelve years old. Six-foot-three and weighing in the one-thirties is a little bit on the light side. I had to take a look at the bigger picture of my personal life and life in general. The experience has helped me redefine a lot of things. What happened after you left Haiti? I came home with the idea that I’m not even going to worry about next steps for my life. The leadership of Frazer United Methodist Church said that they expected I would be in Haiti for three years or more, but we accomplished in a year and a half what could have taken three to five years. Frazer continued to support me very generously through this time. They had an understanding of how difficult it had been for me down there. How did you get from Alabama to Wheaton? I was talking with the teaching pastor again, who’d become a good friend. He said, “Well, if you’re not going back to Haiti, have you ever thought about being a missions director or a missions pastor?” So that started me down this road. Then I heard from James Misner, who had my current WBC job before me. He was a friend of a friend in Haiti. In an e-mail he told me about the open position at Wheaton Bible Church, just up the road from Naperville, where I’d grown up, and added that the interview process had been under way for several months. He suggested that I “throw my hat in the ring” and see what happens. About a week later I showed up at the church to hand-deliver a résumé and cover letter. Even during the interview process I didn’t know if I was going to end up here or in Alabama at Frazer. I just knew the Lord would make it clear; I also came to know that this was the place to come. 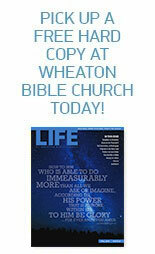 I mean, very frankly, it was just made clear to me that if Wheaton Bible makes an offer, take it. The church made the offer, I took it, and started May 13. 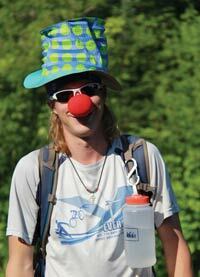 Clowning around on this year’s Canada GO Team. The title is Global Outreach Mobilizer. That means I plug in to all aspects of our Global Outreach ministry, as well as help every other ministry get involved with global missions. On a day-to-day level that means I give strategic oversight to all our GO Teams (teams sent on short-term mission trips). It involves selecting where we’re going and what missionaries we’re partnering with, supporting them, and assembling teams. A big part of it is how we prepare, send, and debrief teams. GO teams are just one part of life lived missionally. A part of my job is to figure out how all this plays a part in the much bigger puzzle of being a disciple and a follower of Christ. So the term mobilizer in my title refers to mobilization of the church body toward more effective cross-cultural ministry engagement. Tell us about your first WBC GO Team experience. I joined a team of our students on a trip to Turkana, Kenya, as a part of our HOPE[KENYA] initiative. Six young women and three guys participated, along with Student Ministry administrative assistant Amanda McLaughlin, who led the trip. The team included Global Outreach Pastor Bill Oberlin and me. This was, by far, the farthest these students had ever been away from home—not only geographically but culturally. Just going to Nairobi was culture shock. And then we joined youth from Nairobi, who experienced serious culture shock themselves in Turkana, which is about a thirty-hour drive from their homes. There’s the head knowledge about the trip being really extreme and challenging. And then you actually get to the really extreme and challenging, and it’s this deer-in-the-headlights moment for so many. First there was the sense of isolation you have when everybody else is speaking a language you don’t understand. As individuals, especially as Americans, we’re so self-centered that we think, Every time I hear them laugh, they’re laughing at me. The isolation you feel can be incredibly frustrating. I’d been through it for years at a time before. These kids hadn’t. It was really tough. Then there’s the food challenge. To know that you are really hungry and still four or five hours away from any kind of meal, and that you might have to spend four hours cooking it, was overwhelming for some. But at the end of the day what lesson is learned? That you were provided for in every way you needed, and abundantly so. Yeah, you’re sleeping on a floor, but you still have a safe place to sleep. Yeah, you’re eating beans, rice, and potatoes, and that’s different from what you would prepare at home, but you still had a good meal. On the WBC Gathering Grounds patio — a great work space for an outdoor guy like Kyle. What other changes did you see in the students? I watched individual students making decisions about how to respond to what was going on. A student might be thinking, I’m really miserable right now. This is tougher than I thought.I’m not rocking it like I thought I would. But I’m making the decision right now that says, This is what it is. I have no other choice but to say this is one of the craziest, most challenging experiences I’ll ever have. I should just go with it. And they learned that these types of challenges are beautiful aspects of ministry. Once I saw students make that decision, their complaining stopped. I saw them deal with heavy frustrations and cultural differences and all the other challenges that came their way. I saw a lot of them take that deep breath and keep moving instead of giving up. That’s a life-transforming experience in ministry—being pushed far out of a comfort zone but then finding the strength of the Lord and, in that strength, feeling capable of living outside that comfort zone. Each of those students now has a comfort zone vastly wider than it was before that trip. There’s no doubt about that. This entry was posted on September 9, 2013 by Wheaton Bible Church in Fall 2013 and tagged 410 Bridge, deaf community, global outreach, Global Outreach Mobilizer, Haiti, HOPE kenya, InterVarsity, Kyle Reschke, WorldTeach.